Primitive is, I believe, the critical term in anthropology, the word around which the field revolves, yet it remains elusive, connoting, but never quite denoting, a series of related social, political, economic, psychological, and psychiatric meanings. That is, primitive implies a certain level of history, and a certain mode of cultural being, which, in this paper, I shall make a further attempt to formulate. This mode of cultural being is continuously obliterated or attenuated by the processes of civilization, and more radically so than we are usually able or willing to acknowledge; as a result, the image of an identifiable, cross-cultural, pre-civilized, and, yes, a priori human nature has practically disappeared from our conceptual lexicon. Unyielding cultural relativism, cultural determinism and social scientism are, in part, and each in its own way, rationalizations of a civilization that has forgotten what questions to ask of itself. These attitudes have helped blunt the sense of universal human need, conflict and fulfillment which has been most adequately expressed, in the past, through art and religion. It is, I believe, a singular task of anthropology, no matter what its practitioners call themselves, to assist in the reformulation of pertinent life-preserving questions. 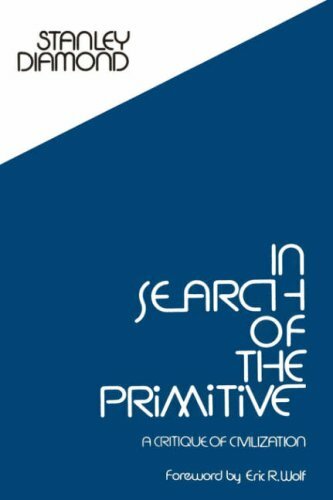 The search for the primitive is the attempt to define a primary human nature. Without such a model, or, since we are dealing with men and not things, without such a vision, it becomes increasingly difficult to evaluate, or even to understand, our contemporary pathology and possibilities. More pertinently, without an anthropology bent on rediscovering the nature of human nature, the science of medicine may survive, but the art of healing will wither away. For healing flows from insight into primary, "pre-civilized" human processes, into a comparative and individualized sense of human needs; that is, it presumes a knowledge of the primitive, a sense of the minimally human, that is, of what is essential to the condition of being human. Human consciousness is historical; in order to understand ourselves, to heal ourselves, in this age of abstract horror, we must regain the sense of the totality and the immediacy of human experience. In order to determine where we are, we must learn, syllable by syllable, where we have been. The sense of history is, for society in crisis, what relentless self-searching, psychoanalytic or otherwise, is for the individual in crisis, that is, it can be releasing and enriching, cathartic and creative; it may be the only thing that can save our lives. History implies exhortation, because it is confession, failure and triumph. It is the measure of our capacity, the link between man and man, the key to ourselves. The lack of the sense of history, or the mechanization of history, that is, the view of its processes as immutable and inevitable, is the death of man. The only inevitable, literally unavoidable, events are, in the cultural sphere, accidents, and certain categories of natural phenomena, which, from the human perspective, have the fatality of accidents. Yet, the "post-historic" creature, necessarily congealed in a bureau and reduced to a function, is a common enough plotting of the future. This image of the human termites of tomorrow, each exuding its specialized bit of culture to what is conceived as an infinitely rich and almost palpable social whole, used to be one of Kroeber's favorite predictions, based, as it was, on Wheeler's work with insects, and attitudes toward men. All those who assimilate human history to natural history, or mechanize it, help dull the sense of history and prevent men from confronting themselves. The penalty we pay for blunting the historical sense is dissociation,both social and individual; the tripping of the fuse on the bomb, will, under such conditions, become only the ultimate incident in the course of a chronic cultural illness – something abstract, that we nevertheless do. "When we contemplate the past, that is, history," Hegel said, "the first thing we see is nothing but ruins." Out of these ruins of civilization, we must win through to a whole, but concrete, vision of man. Every thinker of consequence from the beginning of the industrial revolution, to the present has, in one way or another, warned us of this necessity. Darwin, Freud, Marx, Einstein, L. H. Morgan, Tylor, Henry Adams, Paul Tillich, Boas, Kierkegaard, Sartre (We read these names like Moslem beads, but do we understand them? ), have, while concentrating on particular problems, urged us to a vision of the unity and autonomy of man. Modern anthropology itself, as Lévi-Strauss has, in effect, argued, probably germinated in a search for the historical contrast to our own intolerable condition, in a search, that is, for the primitive; it was, no doubt, as he also implies, an expression of remorse for the ideological and technical conquest of the planet by western Europeans, themselves restive in a culture they had learned to wield as a weapon. It follows that the anthropologist has been the, disengaged man par excellence. dissatisfied at home, questing abroad. He is a scout sent out by a civilization in turmoil to find a resting place, and learn the lay of the land. He is, if true to his origins, a type of Ulysses, though, I am sure, more Joycean than Homeric. Modern anthropology is the search for man in history. undertaken by society threatened with automatism In broader perspective, anthropology may be said to begin with civilization, certainly with the Greeks, and perhaps with the Babylonians, the Egyptians, the ancient East Indians or the Chinese. It would be instructive to study the records of the latter four non-western civilizations in order to determine how far anthropology had advanced among them and what forms it took. Wherever civilization arises, the primitive in Man is subordinated; it withers away, grows attenuated or is replaced. Thus the puzzled search for what is diminished, the search for different ways of being human, for the primitive, which is anthropology, begins. Even Plato, who was probably the most beneficently civilized man in history, pays tribute, in the beginning of The Republic, to the satisfactions of his bucolic version of primitive life, which he feels plausibly constrained to replace by his towering and totally civilized Utopia. Plato understood that, in civilization, we cannot know what has been gained; until we learn what has been lost. Later, when brought down to earth in The Laws, the last of the Dialogues, the Heavenly city turns into a rather ominous polity. Plato spent his life trying to define and create a model of civilized man in civilized society. All of his work is a kind of anthropology of civilization, a vast exploration of political society, and it should interest us that it ends on a note of despair. For The Laws is no longer Plato struggling to grasp, to create, civilization as part of an expanding human consciousness; his final social statement is frankly repressive and pragmatic, and prophecy becomes mere prediction. In The Laws, human nature has become the enemy, and we recognize civilization. Freud, had he permitted himself the luxury of philosophizing, would have analyzed the Plato of The Laws perfectly, just as Plato, had he acknowledged the primal necessity of poiesis, of ritual, would have been able to penetrate more deeply into the nature of that “primitive," actually rustic, life which he nostalgically abandons in favor of the ideal state. Yet in The Republic, in contrast to The Laws, whether we like it or not, we are caught by a vision of man finding himself in civilization, although in ways that are hardly viable since they exclude, rather than incorporate, the primitive. If Plato concerned himself with the problems of civilization, ranging from the aesthetic to the technical and legal, at a time when civilization in Greece had become an insoluble problem, other philosophers, writers, travelers, and historians have been more deeply concerned with uncivilized people. Their descriptions vary immensely, and many are clearly projective, or otherwise distorted, but what runs through them all, whether drawn by Herodotus or Tacitus, Ovid, Seneca, or Horace, Columbus or Camoens, Montaigne or Gide, Rousseau or Monboddo, de Bougainville, or Melville or Conrad, is the sense of contrast. Civilized men are here confronting what they presume to be primordial; they are saying, "this is the way we were before we became what we are, this is the other side of our humanity." That is the anthropological statement, and it will always remain the anthropological question. Paradoxically, as civilization increases in depth and scope, anthropology proliferates, but it becomes increasingly professionalized. The urgency of the central question is lost sight of, it is even denied. This question of our humanity is repressed because of its awful urgency, and the risks we must undergo in attempting to answer it. The very circumstances, then, that lead to the deepening need of the anthropological search, that is, the expansion of civilization, also convert anthropology into a mere discipline with narrowing borders, more mechanical techniques, and more trivial goals. It may even come to pass that the central question, the question of what part of our humanity we have lost, and how and why we have lost it, and how and in what form we may regain it, will soon cease to be a concern of anthropology. Perhaps significant statements about man will no longer be made by anthropologists, just as most sociologists no longer say anything very compelling about society, or political scientists about politics, economists about economics, and so on, precisely because these fields, reflecting the larger division of labor in our culture, and increasingly analytic attitudes, have grown .further and further apart. But man cannot be subdivided endlessly; moreover, the most critical tissues escape the scalpel;. it is the entire organism which must be studied. Correlatively, history cannot be quantified; we must win back the courage to evaluate. In the beginning, bureaucracies counted – people, goods, land, in order to muster, levy and control, to record those facts which became the basis for civil imposition. It follows that in the logic of history, a bureaucratized discipline is, first and foremost, a quantifying one. Later, quantification becomes an end in itself, not just, as it always is in the human sciences, a problematic and limited means. The principle of evaluation is absorbed into, or subordinated by, this numbers game-an abstract ploy of counters that avoids policy, principle and meaning by presuming to rise above them. The new pedantry is the pedantry of the machine. The danger that anthropology faces, then is literally this: it is becoming too civilized, too abstract, too bureaucratized. It is being transformed into just another specialized exercise, a symptom of our civilization, congruent with, rather than antithetical to it. The latter is its true patrimony, and it should be a vocation of anthropologists to make this truth known. My contention, then is that the term primitive has content in anthropology; that it cannot be evaded; and that the attempt to explore its implications remains our central task, precisely because we are so civilized, and so in need of a deeper vision of man. It is in this way that anthropology can remain one· of the most instrumental and useful, though it may often seem the most remote and eccentric, of disciplines.